I hope you've heard the rumor (because it's true) that our shearer will be here Friday morning early to get the fiber off the sheep. If you're available at that time, we'd love to have you come roll up your sleeves and help, or just watch from a distance. The picture above is Shadrach - yes, Shad! 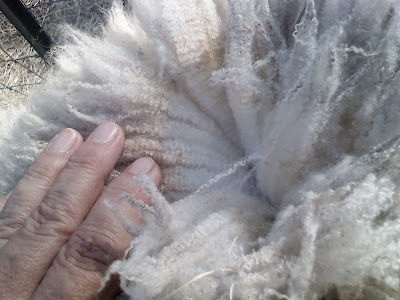 - the meat sheep with enough crimp to rival a merino. I'm getting so excited about having all that fleece off our critters and onto the skirting table. 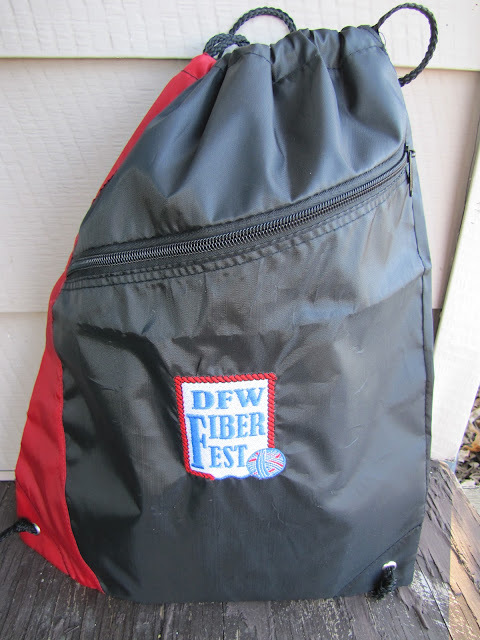 The fiber shares will start coming together! The trick this week will be having dry critters on Friday when Danny comes. Rain is in the forecast quite a bit next week. Wet sheep don't shear well. 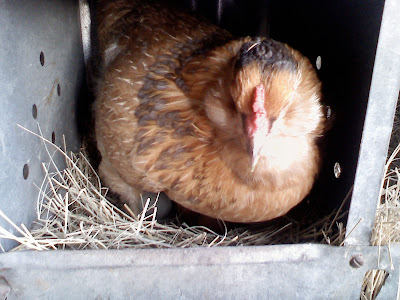 One of our three-year old hens, Rachel, has started laying again. I had almost given up on those old gals, but I caught Rachel in the act of producing a gorgeous olive colored egg. Well done, old girl! Keep up the good work! Currently, we're getting up to 9 eggs per day from the flock! Debris removal went well today, though we didn't completely finish. Our friend Leslie and I cleared out lots of chopped wood, which I think was keeping the east sheep paddock from draining after a rain. DH helped get lots of the brush cut and helped us pull back lots of the old wire. Here, Leslie's hands (which is all she would allow to be photographed) help load the wagon with logs, which we stacked nicely on the outside of the paddock. Anyone need some firewood? I'll make you such a deal! Here's Leslie wielding the bolt cutters, which helped us get through some of the really tough wire. Leslie worked really hard with me - we were both red faced and panting when we decided to call it a day. A lot of that awful old wire had barbs! Anyone need some rusty barbed wire for craft projects? Don't you just love our Phineas? He really looks like Mary's little lamb from the nursery rhyme! The good news today is that Judah has decided that all the sheep should be equally ignored. He will no longer play favorites. Sigh of relief. Once they figured out the barrier was gone, the sheep started right away nibbling on the green vegetation that has begun to pop out along the little lane between the old and new fencing. Another day of pulling old wire out, and the job will be complete, and the sheep can clear the old fence line all the live long day. I hope you enjoyed today's excruciatingly wonderful weather, and that you were able to spend the day in past times that bring you joy! The weather here in UK has been good today too! If you can you must watch Victorian Farm. It may be available from Amazon. It was on the BBC here. When they went to get the 26 sheep for shearing, the animals found a weak bit of fencing and ran off down the lane! Fortunately there was no traffic, but they gave the shepherd and those who were experiencing living as victorians for a year, a good run for their money! The proffessional shepherd said that the only good thing about having to get the sheep back into the yard was that they would have got hot running around and that would ease the shearing by raising the fleece! Not the best circumstances for that to happen, I feel! However, I think you and your shareholders would love the series. From making a victorian dress,to raising Gloucester Old Spot and Tamworth pigs, to making cheese and various traditional celbrations and rural crafts. The Victorian Farm has it all, all that and lambing too! You would all love it! Best wishes and happy shearing day on Friday! Thanks, Caroline! That show sounds wonderful - just right up my alley. I'll do some poking around and see if I can find it! Enjoy your lovely weather! Just to say...........don't poke around looking for it! I have a surprise for you! Looks like great progress! Sorry to say, that I don't need that wire. :) Love the new fence though. Shad's fleece looks great! Phineas is a cutie! Glad to hear Judah has decided that he doesn't need to chase Phineas any more. Judah just probably wanted to show the new guy that he was boss. Thanks for letting me help out Cindy! I hope the clearing we did helped in this rain today... I look forward to the shearing on Friday!!! Leslie - it was draining some, but I think I'll dig a little trench to speed up the process. Love to see it trickling down to the creek! See you Friday!